On the 11th of September the opening of the Archipelago of Ocno took place in Mantova, the Italian Culture Capital 2016. This impressive floating structure was designed by Joseph Grima in an attempt to reactivate the relationship between the ancient city and its lakes which in the past have been perceived as a barrier to the Lombard city. 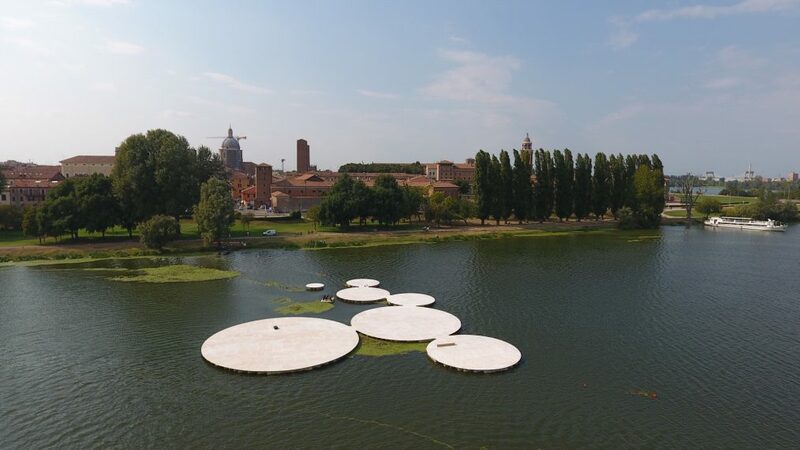 The structure consists of seven floating platforms that are in tangent with each other, and have various diameters ranging from 4 to 20 meters. The archipelago was built by using recyclable materials, and done so with the help of local prisoners. These floating stages, which are currently accessible by boat, will be the location of music events, theater performances and other cultural events. The opening performance was given by the Mantova Chamber Orchestra. Due to the modular design, the structure can be expanded in the future, creating more space for activities and events in the city’s lake. Visitors will be able to sail over to the floating islands, hang out and observe their city from the waters perspective.